Hello, this is Briana! I’m on vacation in West Virginia this week, so I’m publishing some wonderful guest posts. As soon as I’m back, we will return you to your regularly scheduled programming. Until then, enjoy! The bullet journal. It seemed to come out of nowhere. For some people, it may be too much flexibility and not enough structure. For others, the flexibility means freedom and creativity. If you’re new, the official bullet journal website outlines the basics. Give it a quick read. I can wait. Read it? You know what “Collections” and “Migration” are? Good. The beauty about bullet journaling comes from the customisation. The basics really are the basics: there are no limits to what you can include. 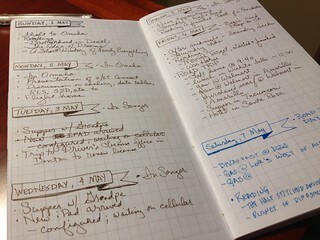 My system has changed often since I began at the end of March as a to-do list and day planner. I’m now rethinking what I include. My brainstorming led me to ideas for bookish spreads to re-focus on writing and reading! Calendars can range from one month to multiple years, depending on your needs. New release dates: Don’t forget that amazing book coming out in eight months! See at a glance when you need to start saving for those new books. Deadlines and due dates: Mark your writing deadlines—from drafting to editing to marketing—so you can try to avoid procrastination and last-minute anxiety. Also avoid overdue fines from the library by writing books’ due dates. Although I don’t use collections, I won’t discriminate! Plotbunnies: Jot down your random ideas. Seeing them all in one place can help find ways to bundle them together. Expand to bits of dialogue or description. Quotes: Inspiration, motivation, great lines… You name it, you write it. Books read: Goodreads can feel so impersonal. Jazz up your reading history by doodling a bookshelf of empty book spines. Go simple with just the title, author, and date you started and finished. Book statistics: How many female and male writers? How many indie authors? Make a chart to see your own reading habits and trends. Trackers are a simple way to see how often you do something. The scope can range from daily to weekly to monthly. You can fill in boxes, use checkmarks for successful days and X’s unsuccessful days, or try the sticker method Briana raved about to encourage you! Writing habits: See how often you’re writing. Daily? On weekends? In spurts? Track it! Word counts: Set a word count for that day, or decide a minimum word count per day. Check it off when it’s reached. Pages read: I can read a book in a day or go weeks without reading. I want to improve my reading habits by tracking a set number of pages or time spent reading each day. If you’re afraid to commit to a notebook, use a sheet of paper to experiment. Pinterest and Instagram are fantastic places to inspire layout designs. I’ve definitely lost sleep admiring the creativity in the BuJo community. . . So, have I converted you? Give it a shot—there’s nothing to lose but some ink and paper. Coryl o’Reilly is a Canadian writer, artist, and LGBT and mental health advocate. She intensely loves lemons, Studio Ghibli, and poetic prose. You can find her on Twitter, Instagram, and her blog. Thanks so much for writing this post, Coryl! What do you think about bullet journaling? Guest Post: Molly Ford of Smart, Pretty, and Awkward!